You buy some big bags of candy weeks in advance because they’re on sale and you better stock up now. You grab a candy here and a candy there. Before you know it, the bag of candy is gone and it’s not even Halloween yet! So, you set out to buy more candy and decide not to eat it this time. Then, you spend Halloween night secretly raiding the leftovers from your own purchases as well as the goodies in your kiddos’ loot. Insert candy hangover. Guilt. Frustration. Exhaustion. And all the feelings that come with overeating, binging, and feeling out of control with food. You can’t seem to get a handle on your food and you’re frustrated with it. Every time a holiday comes up, you ALWAYS overeat. You ALWAYS feel out of control with the goodies, snacks, and treats. Plus, Halloween is kind of a gear up for the coming holidays and you’re already feeling defeated. So, today I have 7 simple tips for you to help you avoid that Halloween binge and food guilt. And even though it’s specific to Halloween, these tips can guide you similarly as you navigate food and the holidays. And if you consider yourself to struggle with emotional eating in general, head on over and take my free course that will help you identify and overcome emotional eating no matter what situation, holiday, or life event is happening. You can check out the free course here. This is my top tip to help me avoid the candy altogether. I used to buy my favorite candy and then nibble on it throughout the month. It was gone before we even made it to Halloween. Choose a couple different kinds of candies that just don’t tempt you. And that doesn’t mean you have to get the cheapo candy. For me, chocolate is a must have. If it’s near me, I crave it. So, I either find a couple candy bars that I don’t love (such as twix bars) that I know other people love, or I buy sugar candy (such as starbursts) that don’t tempt me at all. Find something that doesn’t tempt you, and then you won’t even have to worry about it! And if it all tempts you, try tip #3. Having a large bag of candy sitting in your pantry is a huuuuge temptation. Each day you feel you “deserve” or “need” a treat, you’ll go straight for the candy. Just wait. You might even find a good sale by waiting until the last minute. And judging by the massive after-halloween sales, I’m certain the stores won’t be running out of candy before Halloween. What if you stepped out of the norm for a bit and came up with an idea that isn’t candy? Last year, I passed out temporary Halloween tattoos and stick on earrings. I also had a little candy available. Some kids when straight for the candy, but others liked the unique trick or treat variety! Depending on how many trick-or-treaters you get, you could try handing out juice boxes, stickers, or any little cheap, but fun for kids toy you get at the party supply store. Plus, then you’ll be known as the “cool” neighbor for doing something different! I don’t like the use the word “rules”, but I think having “guidelines” is a great place to start. Ask yourself what your typical binge looks like? Then, create some guidelines to pare it back a bit. If you find yourself eating 10 pieces of candy on Halloween night, can you cut that in half and have a guideline that you will mindfully (see tip #6) eat 5 pieces instead? Or, if you must buy Halloween candy early, can you pull out 5 pieces into a bag on their own and that’s how many you can eat before Halloween? Setting guidelines help you know what you’re going to do before you actually do it. It helps you create boundaries for yourself and then when you hit that 5 candy mark, you know it’s time to stop and move on. Which leads us to tip #5. A choice that is made beforehand makes the choice in the moment easier to make. If that sentence doesn’t make any sense, basically if you’ve already made a plan, then when the time comes for you to make a decision, you’ve already made it! This is likely not your first Halloween. Think about years prior. What do you struggle with most? The days before Halloween? The actual Halloween night? The days after with all the leftover candy? Make a plan for the times you struggle most. If you find yourself prone to binging on candy after Halloween, what can you do to avoid the binge this time? Do you need to get the candy out of the house immediately? 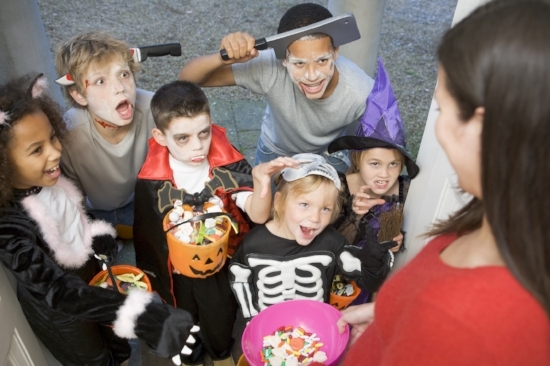 Do you need to set aside some candy just for you and set some guidelines for yourself? When you have a plan, you don’t find yourself binging in the moment because you already know what you’re going to do. Remember, don’t make your plan impossible. Make it realistic for you. If you love Halloween candy and chocolate, don’t tell yourself you’re going on a sugar fast right before Halloween. Learn to have balance with your food (see tip #6). Set realistic plans and goals. If you need to, write them down, tell them to your spouse, get some accountability, whatever you need! Mindful eating. Intuitive Eating. They are definitely buzz words going around right now. What do they mean? I created an entire mindful eating series to teach you all about mindful and intuitive eating if you want to get started here. It’s a series of 4 posts to help you start learning to eat intuitively for your body. For today, your crash course in mindful eating is to actually sit down and pay attention when you’re eating the Halloween candy. Don’t pop one in your mouth as you run out the door, or as you’re talking on the phone, or because you saw it sitting on the counter. Take a minute to enjoy the candy. You don’t have to spend 15 minutes salivating over the candy, but all you need to do is to remind yourself to sit down for 1 minute and notice the sensation of the candy. Do you still like it as much as you thought? Maybe you’ve been mindlessly eating certain candies all along. Or maybe you really love it and you remind yourself that you can enjoy treats like this as long as you do it mindfully and listen to your body. It’s ok to indulge every once in awhile, especially to avoid binging further down the road because of extreme restriction. And lastly, avoid extreme hunger. This goes along with the intuitive eating approach. If you’re ravenous, the last thing you probably want is a healthy, well-balanced meal. You want whatever will fit in your mouth this second. Am I right? If we allow ourselves to skip meals or snacks when our bodies tell us they’re hungry, we tend to wait until it’s too late and then we want the quickest (and usually unhealthiest) option. Listen to your body throughout the day. A good rule of thumb is to not go without eating for more than 5 hours. If you’re not a snack person, that’s ok, make your meals larger. In fact, head over to read all about learning how to recognize your hunger and fullness levels in this post. Try to avoid extremes on either end of the hunger and fullness spectrum. I hope now you have a few tricks (and treats!) for your back pocket this Halloween!